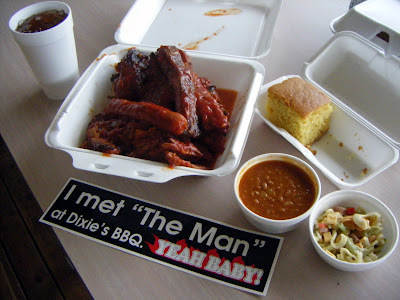 The first time I met Gene Porter, the man behind “The Man” at Dixie’s BBQ in Bellevue, I was eight months pregnant and looked it. As he approached my table, his battered pan of hot sauce in hand, he shook his head in the universal sign that said, “Uh-uh.” His reasoning was, if he gave me what I was asking for — a chance to “Meet the Man” (his signature sauce) — I’d be meeting up with my obstetrician sooner than planned. But he caved when I begged, and allowed me a toothpick bearing a trace of his fiery fuel. A month later, Nate was born. On Sunday, Gene Porter died of cancer. May he rest in peace. Dixie’s is closed this week while family and friends mourn his passing, but longtime customers can expect to meet up with the man’s Man thereafter.